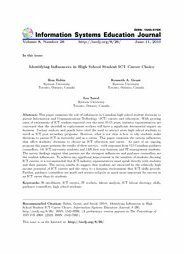 Abstract: This paper examines the role of influencers in Canadian high school student decisions to pursue Information and Communications Technology (ICT) careers and education. With growing rates of retirements of ICT workers expected over the next 10-15 years, industry representatives are concerned that the shortfall in replacement workers will have a significant detrimental impact on business. Various authors and panels have cited the need to attract more high school students to enroll in ICT post secondary programs. However, what is not clear is how or why students make decisions to pursue ICT in university and as a career. This paper examines the various influencers that affect students’ decisions to choose an ICT education and career. As part of an ongoing program this paper presents the results of three surveys -- with responses from 111 Canadian guidance counsellors, 141 ICT university students and 1335 first year business and IT management students. The survey findings suggest that parents are the strongest influencers and guidance counsellors are the weakest influencers. To achieve any significant improvement in the numbers of students choosing ICT careers, it is recommended that ICT industry representatives must speak directly with students and their parents. The survey results do suggest that students are attracted by the relatively high income potential of ICT careers and the entry to a business environment that ICT skills provide. Further, guidance counsellors see math and science subjects as much more important for success in an ICT career than do students.